Monday April 30: Sound Art, Newport, Mural Unveiling! We hosted an unveiling party for the new Chestnut mural design! We talked about how this new mural can serve as a conversation piece for hosting other events related to current social topics. Andy Graydon temporarily installed his piece, "To Scale (10,000 Things for Mark Tobey) this week in the Liberal Arts building on campus. 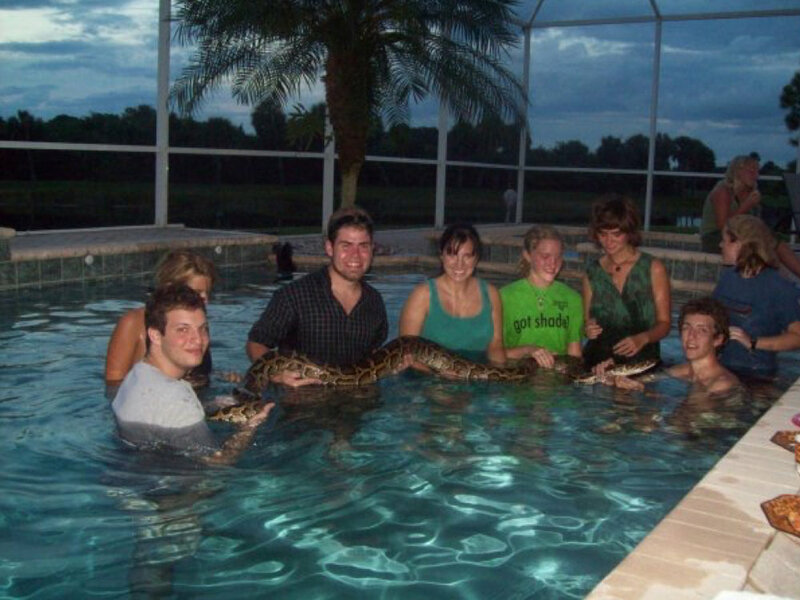 This awesome experience was organized by Dr. Rebecca Uchill. Brittni Ann Harvey organized an incredible exhibition featuring work from students at UMass Dartmouth, RISD, and CCRI, and we had an opening reception this week for the show at the Trinity Church Parish House in Newport Rhode Island. Almost all of the artists made it for the reception, and they got to interact with each other and also with local folks from Newport. Non-Event took over the College of Visual and Performing Art building on campus this Friday with their piece "Sonic Section Perspectives (For Paul Rudolph): An Architectural Sound Activation for UMass Dartmouth." Thanks again to Dr. Rebecca Uchill for organizing such an inspiring event. Monday April 23: Painting, Banquets, Exhibitions! Opening later this week is an exhibition curated by Brittni Ann Harvey in Newport, RI! Next Tuesday May 1st, 11AM in Star Store room 254, come hear Roz talk about the origins of CURE, and at noon, you can check out the CURE installation in room 228! On Thursday April 18, we co-hosted a painting night with the RAs of Pine Dale Hall! On Friday April 20th, we hosted a live screen printing event as part of the Unity Fest. First Charlotte Hamlin taught us how to burn screens from designs that a few of us created to represent unity, then we learned how to screen print, and then we taught visitors at the Unity Fest how to print! All of the prints we made will be compiled into a tapestry designed by Darlene Thevenin, Jovi Ramos, and Ariana. Designs were contributed by: Toni Chambers, Darlene Thevenin, Jovi Ramos, Ariana, Cody Oliviera-Gingras, and Roz Crews. Our book, Publix was featured in an exhibition about Paul Rudolph and Brutalist architecture at UMass Dartmouth, and it was added to the UMass Dartmouth library! RA Dennis Fox won "Outstanding Learning and Living Community Program" at the Housing and Residential Education Award Banquet for the program we did last semester about critiquing art in a gallery. Monday April 16: Senior shows, upcoming projects, the end is near. This awesome crew of photography students is graduating this semester, and their senior show opened this week! Additionally, this team has been working hard to put together our final photo installation for the new SMAST building in New Bedford. Here are our official SMAST portraits and some of the walls we're hoping to fill with our photo installation. Jill Ratcliffe included this photo of the #doggiederive in her final photo book about happiness. Darlene and Jovi have been planning a live-screen printing event to make a new tapestry for the Campus Center! The theme is Unity, and we will be printing fabric with five original designs during the Unity Fest this Friday April 20th! Niki Winning is preparing for a new socially-engaged performance project where people can borrow one of these clay bodies to take to a place they've never been before. Very fun studio visit this week. 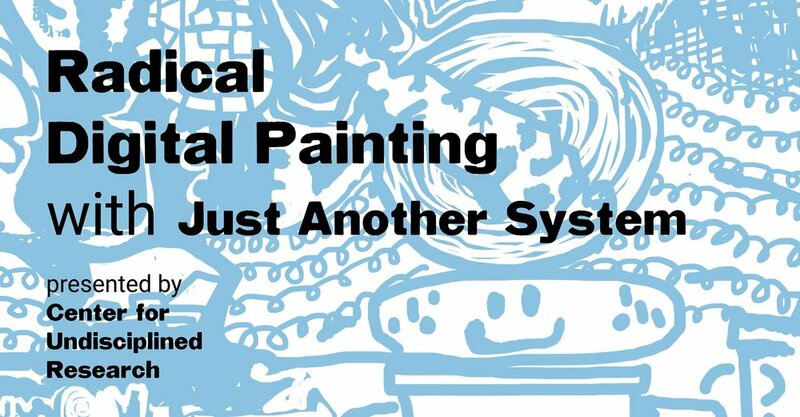 This week Roz will be leading a painting workshop for 40 people in the Pine Dale Residence Hall! Who knows what will happen. Monday April 9th: Spring is almost here! On Tuesday April 3rd, Kameelah Janan Rasheed joined us from New York for studio visits and a public lecture about her practice. It was wonderful to hear her talk about intervening in public space, her research-based art practice, and the way her personal experiences get translated into her artwork. On Wednesday April 4th, we hosted an exhibition opening of our Frederick Douglass Portrait exhibit at the New Bedford Whaling National Historical Park! Artist Bhen Alan gave an artist talk about the work he made for the show (this giant, amazing portrait of young Frederick Douglass). We also released our fourth newsletter! On Thursday April 5th, Roz visited Dr. Uchill's ARH 200 class to give a lecture about how her own public education informed the creation of the Center - and before she presented, these students were talking about Kameelah's work in the context of socially-engaged art. Some of the slides from Roz's lecture. The painting and printmaking club and the figure drawing club brought Tomashi Jackson for a public lecture on Friday April 6th! She discussed how her research about Brown vs. Board of Education enters into her practice as a painter. Roz and Dennis hosted a workshop to design a new mural that will be installed in Chestnut over the next couple weeks. Monday April 2: Artist talks, painting, and murals! Tomorrow we're hosting a talk by Kameelah Janan Rasheed! Join us at UMD's Dartmouth campus from 7-8:30 for the talk! Thanks to Sawyer for writing a lovely article about CURE for The Torch! This is from last week's issue. We co-hosted a painting event in Hickory Hall last week in collaboration with RA Tim. Everyone was invited to paint their "culture." We had an interesting conversation about our various definitions of the word culture. Caroline Woolard and Leigh Claire La Berge joined us last week for a public talk. Huge thanks to Ellen Mueller and Rebecca Uchill for organizing. This Friday! 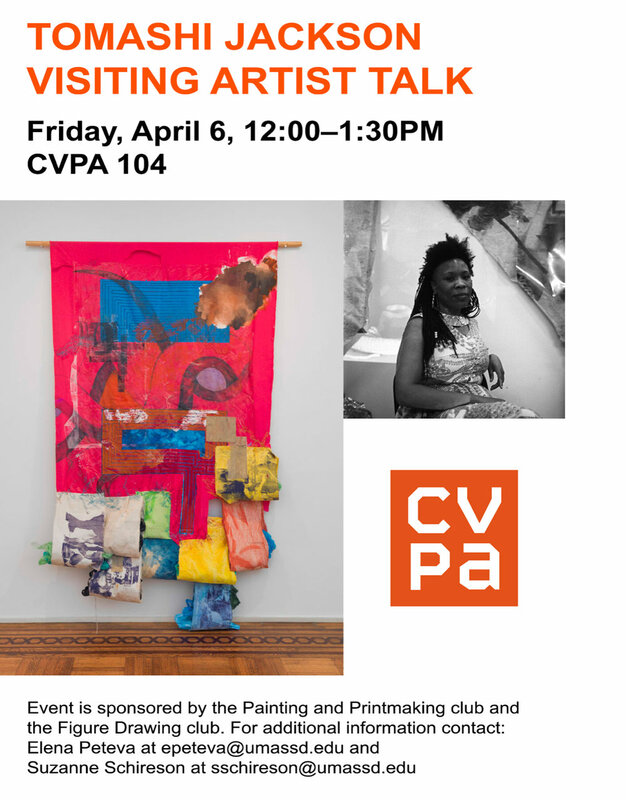 Tomashi Jackson will join us, thanks to the Painting and Printmaking club and the Figure Drawing club for sponsoring! On Sunday April 8th at 5PM, join us for a mural designing workshop hosted by Dennis Fox in the Chestnut Residence Hall! We're planning to install a mural about "social justice" this spring, and this is your chance to participate in making the design! We're organizing an earth parade taskforce to make costumes for the annual New Bedford Earth Parade! If you or anyone you know would like to help out, contact Roz at rcrews@umassd.edu! Last Tuesday, we got the opportunity to go out on the UMass Dartmouth Marine Research Vessel with Dr. Jeff Turner and his lab. They've been collecting research about the water quality in Buzzard's Bay since 1987 - this was their 375th boat ride. It was an amazing experience, and we learned a ton. The photos we took during this trip will become part of our public installation at the new SMAST building! Public lecture on Friday March 30th, 11:30-12:30PM! With Caroline Woolard and Leigh Claire La Berge in the Fishbowl on the third floor of CVPA at UMass Dartmouth! Caroline Woolard is an artist and organizer whose work explores intersections between art and the solidarity economy. She primarily works collaboratively and collectively and was a founding member of Trade School, OurGoods, and BFAMFAPhD. Leigh Claire La Berge professes at the intersection of arts, literature, visual culture and political economy. She is currently Assistant Professor of English in the Department of English at BMCC CUNY. Her book Scandals and Abstraction: Financial Fiction of the Long 1980s was recently published by Oxford University Press. Read Michelle Chihara's wonderful essay "What We Talk About When We Talk About Finance" in the Los Angeles Review of Books, which not only reviews the book, but asks what the relationship between the humanities and finance should be. Her co-edited volume Reading Capitalist Realism (Iowa, 2014) was released last year in the New American Canon series. In 2012, La Berge co-curated an exhibition on art and debt, "To Have and To Owe" with Laurel Ptak at the Elizabeth Foundation for the Arts in NYC. Kameelah Janan Rasheed is a learner seeking to make her learning and thinking visible through an ecosystem of iterative projects such as “architecturally-scaled collages,” (Frieze Magazine, Winter 2018), poems/poetic gestures/words in the proximity of poems, long-form essays, publications, large-scale public works, digital archives, teaching, curriculum development, lecture performances, stand up comedy, and other forms yet to be determined. Her work has been presented at the 2017 Venice Biennale, Institute of Contemporary Art - Philadelphia, the Kitchen, Printed Matter, Jack Shainman Gallery, Studio Museum in Harlem, Bronx Museum, Queens Museum, Schomburg Center for Research in Black Culture, Brooklyn Academy of Music, Pinchuk Art Centre, and others. To celebrate the legacy of Frederick Douglass during the 200th anniversary year of his birth, the Center for Undisciplined Research at UMass Dartmouth organized an exhibition of portraits of Frederick Douglass created by students from the university. The Center chose to make an exhibition of portraits because of Douglass’ reputation as the most photographed person in the 19th century. 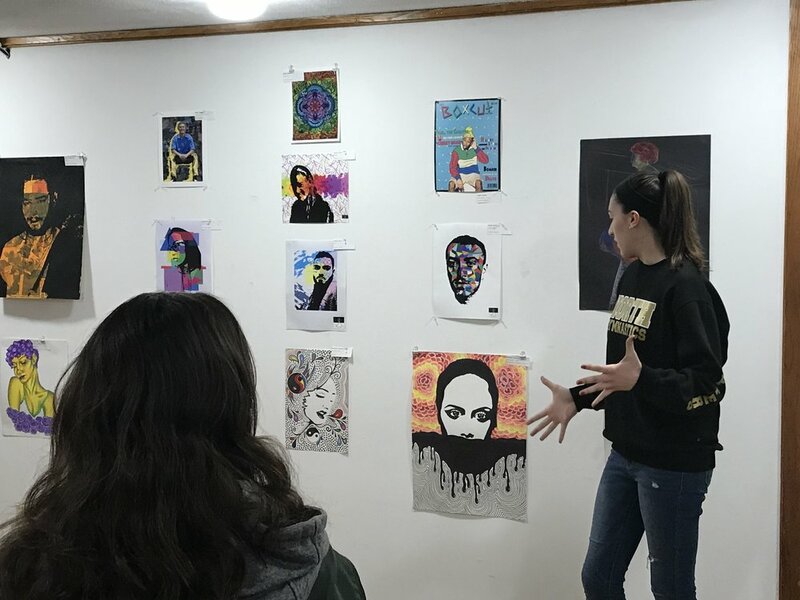 The pieces in this show represent a variety of mediums including digital painting, charcoal, acrylic painting, colored pencil, graphite, and marker, and the images range from photo-realistic renderings to abstract portrayals. 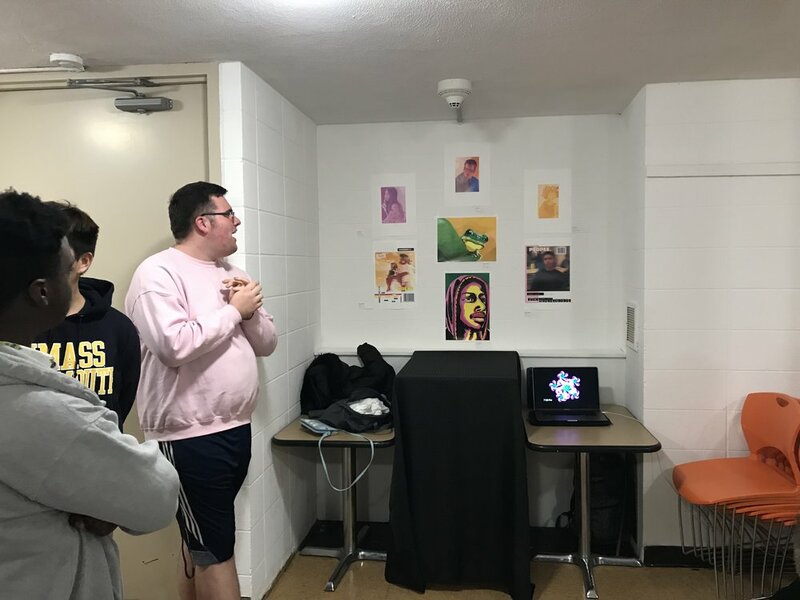 Special thanks to Ellen Mueller’s Figure Drawing class at the College of Visual and Performing Art for contributing work to the exhibit, and thanks to the Frederick Douglass Unity House for hosting the first exhibition of this work. Caitlyn Barbosa, Sydney Brake, Lydia Collins, Delvina Driscoll, William Hart, Morgan Lobo, Nina Nguyen, Tess Oldfield, Darley Garcia, Mae Pacine, Gina Pantalone, Hanna Rabstejnek, Alaia Rios, Ben Urdi, Ally Watts, Cody Oliveira-Gingras, and Bhen Alan. Pallavi Sen is from Bombay, India. She works with installation, printmaking, textiles, Instagram, and intuitive movement. 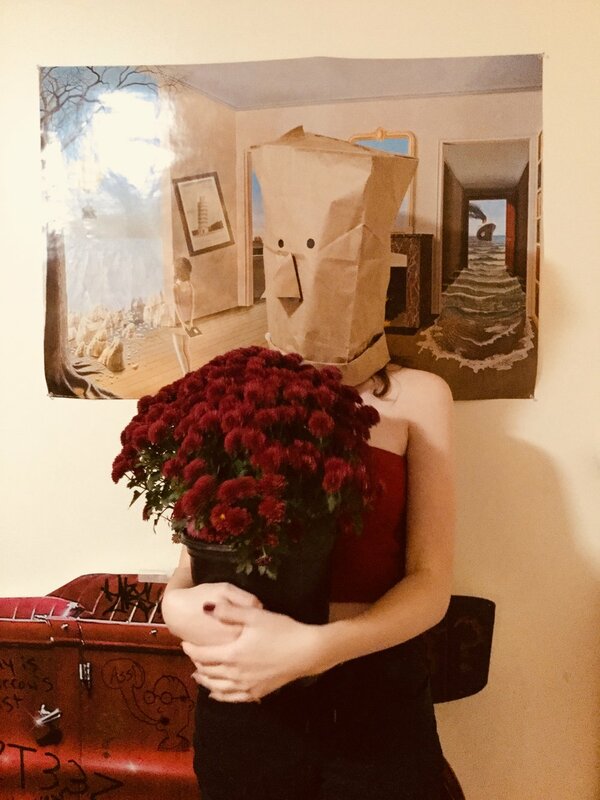 Current interests include inner lives of birds and animals, South Asian costumes, domestic architecture, rituals, altars, deities, skate/bro culture, style, pattern history, toxic masculinity, friendship + love, her future lover, farming and the artist as farmer, work spaces, work tables, eco-feminism, love poems, the gates to Indian homes, walking, and cooking deliberately. She supports her work + New York rent through various jobs, projects, spaces, residencies, and schools. 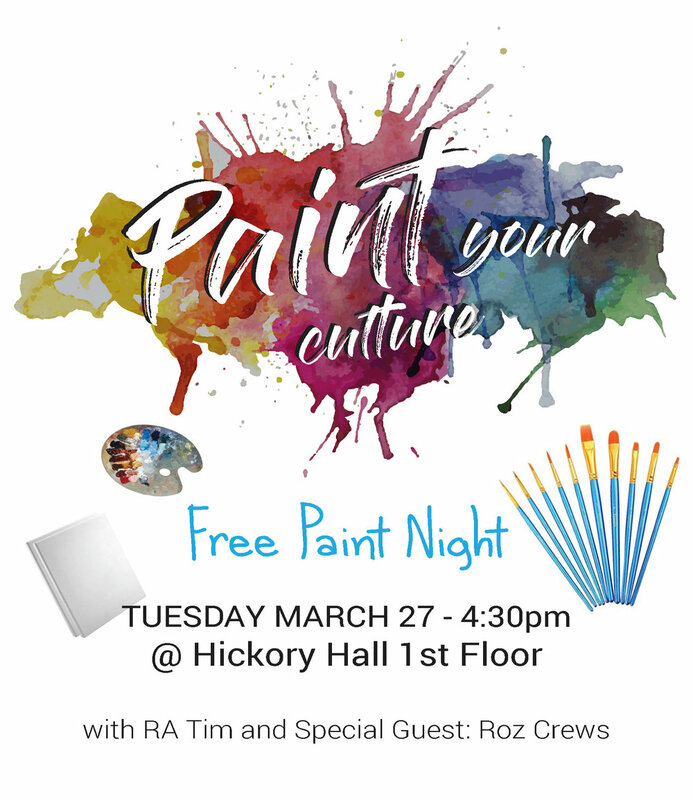 Tomorrow we will be painting with RA Tim in Hickory Hall, discussing what it means to have a "culture." 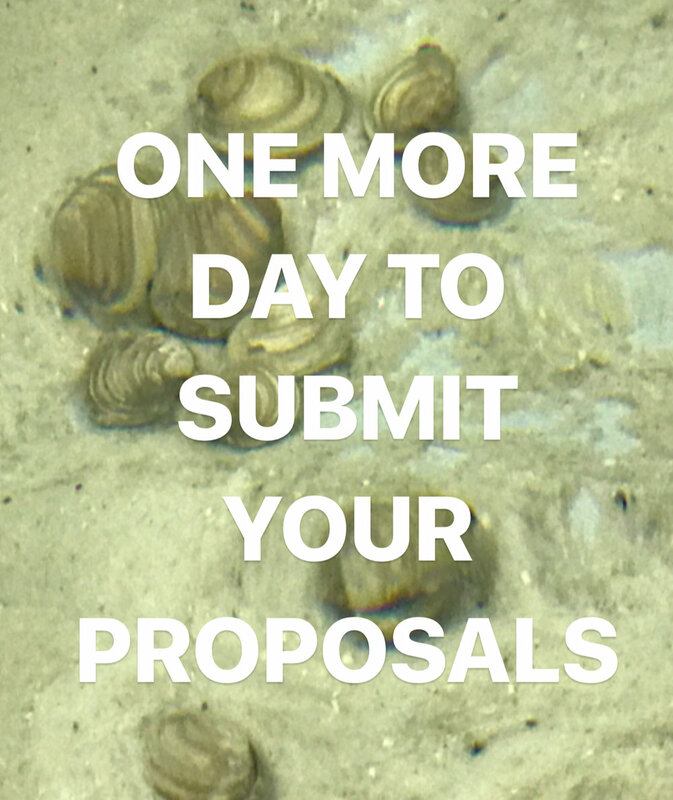 March 19: Pop art, marine science, giant collaborative circles, etc. 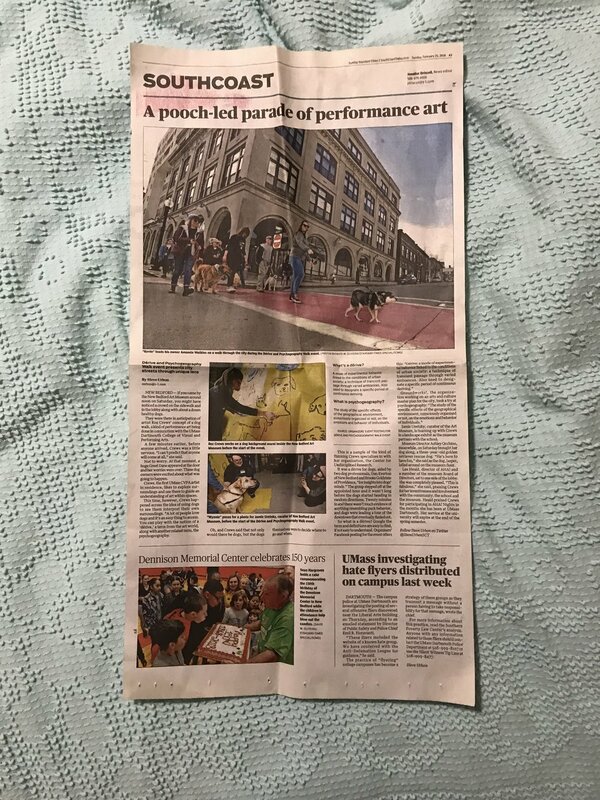 Our doggie dérive was in the newspaper! We also found a printed magazine with the article about CURE. On March 6th, I did a summary assignment with the ARH 102 class. All 200 of us did a phenomenological experiment with 400 pieces of clothing. We made a circle with the clothes without first establishing a plan of action, the circle came together organically which reminded me of a story my friend Adele told me. Apparently, one of her former students says, "A circle is the most democratic shape." We also talked about Lee Mingwei's Fabric of Memory project, and we learned about one my first "socially-engaged art projects" called "Clothes that spark joy." The whole experience was chaotic, a little embarrassing, and really fun. Ant Farm/Art Fam had its second opening of the year. This show was organized by James Tooker, and it featured a lot of excellent artists interested in pop art. There was evening a projected slide show, plus a great round of artist talks. Today we had an awesome photo shoot at the School of Marine Science and Technology. Lots of scientists and researchers lent us objects they use in their practices, and we photographed them while practicing our studio lighting skills! Tomorrow we're heading out with a science team on a survey of Buzzards Bay! Can't wait to see the final installation of photographs come together in the building. This week was the big #doggiederive. The purpose of this event was to host a creative learning moment where we could talk about the art historical term "dérive" invented by Guy Debord as part of the SCAPES: Placemaking in the twenty-first century exhibition curated by Jamie Uretsky at the New Bedford Art Museum. There was a lot of press about the event, too! "Your Weekend Goes to the Dogs" by Groundwork! We're gearing up for a photography session at SMAST on March 19th. We've invited scientists, students, researchers, and others working at the building to bring objects that represent the work they do to our makeshift photography studio in their lobby! James Tooker is organizing the next exhibition in Ant Farm/Art Fam, the gallery in Chestnut Residence Hall. Submit your work to him today! February 19: Frederick Douglass, newsletters, and news! We received a lot of proposals for the Student Art Project, and our selection committee is reviewing applications now! 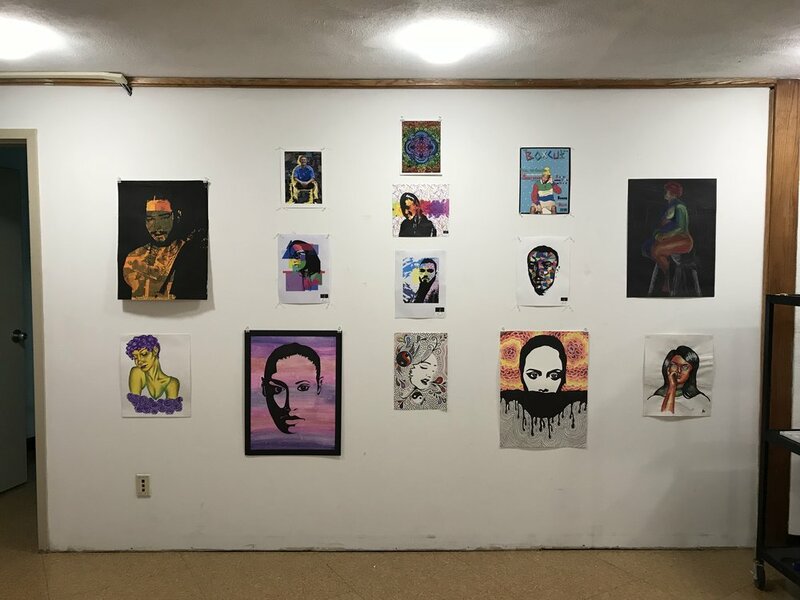 As part of the 200th Anniversary of Frederick Douglass' birthday at the Frederick Douglass Unity House, we presented an installation of portraits of FD made by students from CVPA on February 14th, 2018. We also found out that we will get the opportunity to show the portraits at the National Park in New Bedford later this year in the space below. We presented our first three newsletters as part of "Take Two" an exhibition about collaboration at CVPA. Here's Ben Urdi explaining the project during the artist talk portion of the evening. Printed a ton of CURE shirts this week! Be in touch if you want one, they're free. Wow, it's been an amazing semester so far! Lots of installations and projects in the works...here's a bit about what we've been up to over the last two weeks. We've started working on our installation at the School of Marine Science and Technology! Here are two of the student photographers working on the project - Amanda Leeland and Ariana Leo. We're also learning about socially-engaged photographers throughout the semester as a way to inspire the possibilities of our work - first up was Wendy Ewald! On February 24th, we're hosting a Dog Derive with the New Bedford Art Museum. 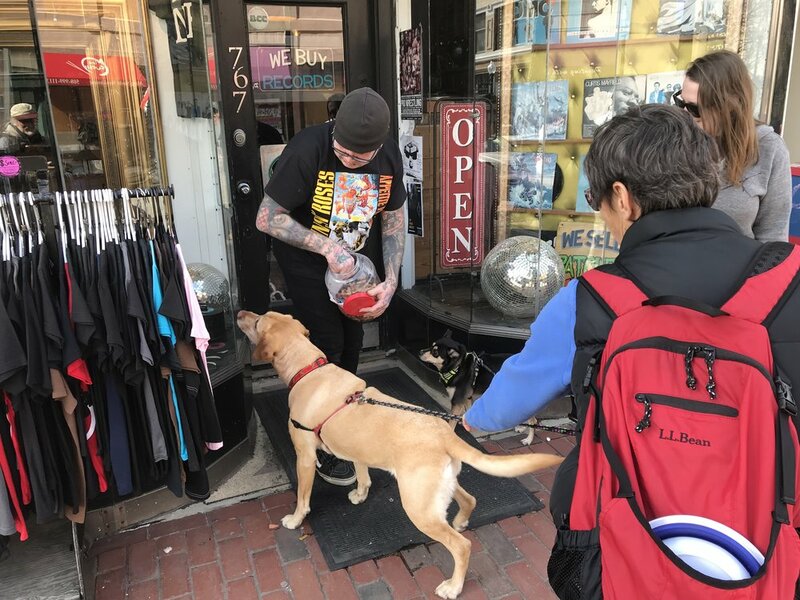 Dogs will be leading us around New Bedford! We hosted a Welcome Back event at the Star Store where we screen printed CURE t-shirts and two wonderful CURE members shared their performances with us - Niki Winning and Ellen Mueller! Also at the same time of the event, Erick Maldonado presented his solo exhibition, I.D. in Gallery 244! When I joined the UMass Dartmouth community as an Artist in Residence (AIR) working with the First Year Experience Program and the College of Visual and Performing Art in the fall of 2017, I had a lot of flashbacks to my first year of college back in 2008. During fall semester of that year, I enrolled in: Introduction to Environmental Studies, Tropical Ecology, Introduction to Anthropology: Heritage Studies, Animal Thinking, and Introduction to Sociology: Social Problems. As you might imagine after seeing this list, I felt completely lost with no idea what I wanted to major in, and I often wondered if I would make it to graduation. Luckily, I found an excellent advisor who supported my broad range of inquiry and helped me organize myself into earning a BA in Anthropology with a concentration in Public Archaeology. That advisor also helped me imagine a future where I was successful and working in a job that made me happy. This portrait series is in homage to the unknown, to perseverance, to the imaginary space we hold to see our future selves succeeding. I think of this installation as a place for students to see themselves as residents in their new home—their picture on the wall of the space where they’re newly living. The production of this project also gave me an opportunity to meet first year students face to face during the first week of classes. During that first week, I invited people to pose for a photo as if it were their very last day of college, and here are the results—a wide-ranging set of emotions and feelings expressed through movement, gratitude, pride, relief, and excitement. Treasure the time you have during school to explore and experience as many things as you can, and never forget to imagine yourself, alongside your peers at the end of this journey. Good luck! This installation was created by AIR Roz Crews as part of the Center for Undisciplined Research with support from UMass Dartmouth Housing and Residence Education. Special thanks to Michelle Black, Eric Petersen, Jake Hogg, and Amber Whitton. If you have any questions, please contact Roz at rcrews@umassd.edu. Our SMAST photo team had a fun, productive day at the seawater collection tank room today photographing all kinds of sea equipment and water! 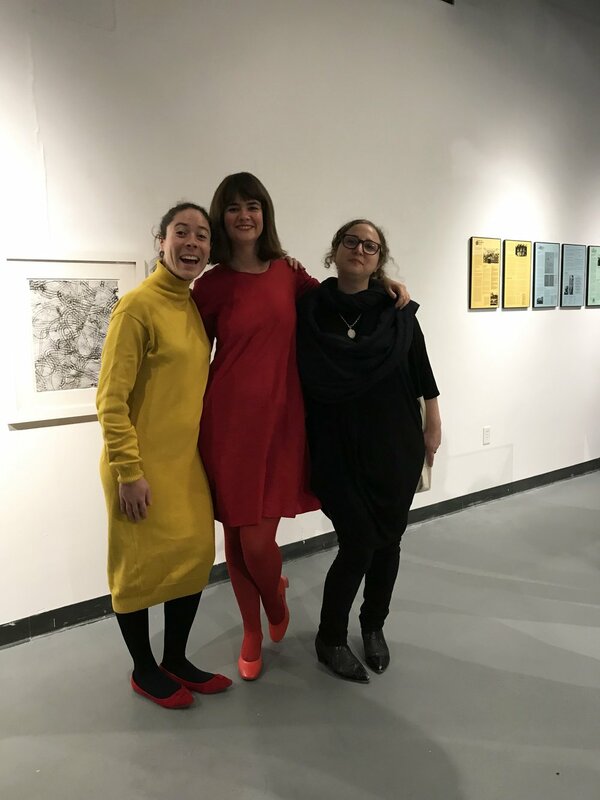 The first three issues of our newsletter, designed by Rachael Abrantes, will be on display starting tomorrow as part of the "Takes Two" exhibition of faculty work at UMass Dartmouth's University Gallery in CVPA! On Wednesday, join us for a celebration of the 200th anniversary of Frederick Douglass' birthday at the Frederick Douglass Unity House from 4-6PM! We've put together an exhibition of portraits of FD for the event. 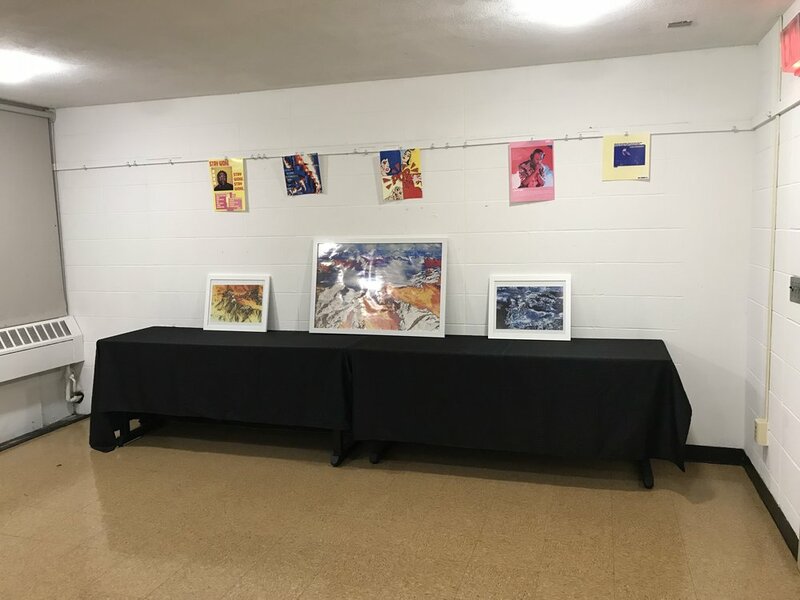 Artwork by: Bhen Alan, Cody Oliveira-Gingras, Caitlyn Barbosa, Sydney Brake, Lydia Collins, Delvina Driscoll, William Hart, Morgan Lobo, Nina Nguyen, Tess Oldfield, Darley Garcia, Mae Pacine, Gina Pantalone, Hanna Rabstejnek, Alaia Rios, Ben Urdi, and Ally Watts. January 29: Back from Holiday! New things in the works. Welcome back from the break! It was refreshing to take a holiday and reflect on some of the things we've done and accomplished since September, but now we're moving ahead with lots of thrilling projects. In the photo above, Ellen Mueller and Taylor (who works in the school's archive) are showcasing the amazing ZINE COLLECTION that is now a permanent part of the archive. Ellen has been collecting zines for the showcase since last semester, and now we have an incredible zine resource available for everyone to check out. The reception for this is on Wednesday January 31st, 5-7PM in the archives next to the library! Earlier this month during Resident Director training, I joined in for a murder mystery event! Here I am crowning the prom queen at our fake prom where the "murder" took place. It's always fun getting to better know the RDs in Housing and Residence Education. We're working together on the new installation that I'm making for the first-year residence halls. The blank windows in the photos above will be filled with colorful portraits of first-year student's pretending to be on their final day of college. As part of Dr. Rebecca Uchill's lecture at the Innovation in Teaching Conference at UMass Dartmouth right before the semester began, I gave a short talk about the process of making Publix (our collaborative book featuring public art from all over the campus). I finished the exhibit about this cork board built in 1993 by Carl Fasano. 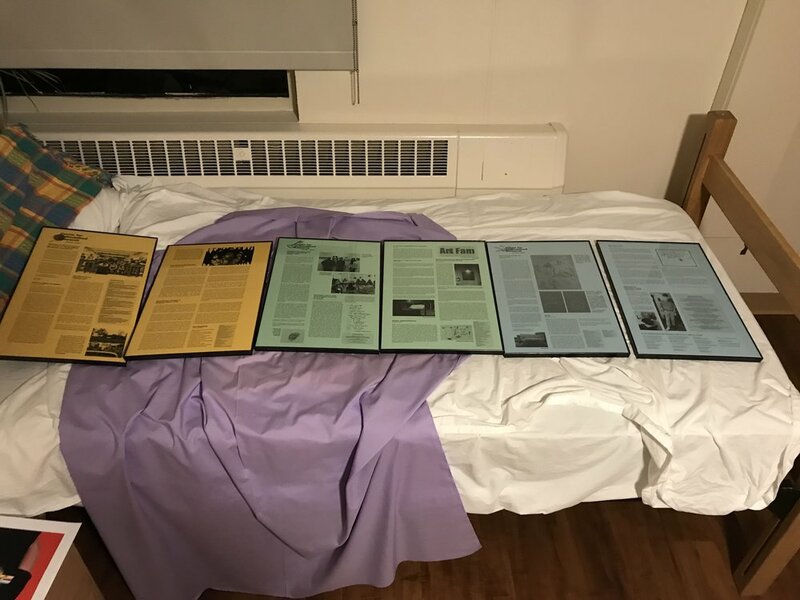 It features a few historical accounts about the board, some student reflections, its origin story, plus lots of photos of it throughout the ages. Today we had our first Info Session about the Student Art Project Call for Proposals, and we're so excited about this opportunity. To see what's possible, learn more about the project, and apply, visit sites.google.com/view/studentartproject! December 18: End of the first semester! Our final newsletter issue of the fall semester! In partnership with the Student Government Association, we've launched a call for a student-centered public art opportunity! Please be in touch about how to apply. We've finally compiled the exhibition about some of the history of this cork board! It's on display now through next semester, and in January we will complete it with a little zine with the information! The UMass Dartmouth Alumni Magazine is writing an article about CURE, so last week a few of us posed for an environmental photo shoot to go along with the article! This week we presented our first book, Publix! It's a catalogue of public art at UMass Dartmouth, punctuated by three case studies about controversial public art from the region. We launched the book as part of Dr. Uchill's Processing Place final presentations, and below are a few images from the other presentations. As part of the current exhibition at the New Bedford Art Museum, we've been collecting stories from folks about their emotional experiences in Downtown New Bedford, and this week Gina and I got to do some illustrations of those stories on the wall drawing map of DNB! We even had a helper, special thanks to six year old Natalyea. On Tuesday, we co-hosted an event with RA Dennis at Ant Farm/Art Fam to talk about various approaches to analyzing art. We had grapes, cheese, and crackers to accompany our discussions. December 11: Analyzing art, book proofs, and marine science. Catherine Moran invited me to the last week of her ARH 102 class to talk about exhibition making. On the first day, we made this phone sculpture of a pizza, and we discussed Akio Suzuki's work and other sound artist who make projects and exhibits of their work outside of traditional art spaces. By the end of class, we decided to make an online exhibition of everyone's favorite works from the class along with works of art they wish they could have studied in the class. I went on an adventure to Country Press in Lakeville, MA to look at proofs of our new publication, Publix! This press has been in business for over forty years. The cork board is in a new position now, to make space for illustration crits! CURE on one side, illustration projects on the other! The student scholarship and fine art faculty exhibitions closed last Thursday, so we got to hear from some of the scholarship winners - here's Erik Maldonando wearing his CURE button and talking about his portraits that honor black student leaders on campus, Taylor Maroney with her work, and Cody Oliveira-Gingras with his paintings and some sunflowers. A few months ago, Brooke Wright - a PHD student from the School of Marine Science and Technology at UMass Dartmouth approached me about doing some kind of public art installation for the new SMAST building in New Bedford. Through a series of conversations and tours of the facilities, we decided to host a symposium on December 8th so that folks from the Center could learn about what the scientists do at SMAST. On Friday, the day came, and we got to enjoy an amazing series of presentations by six scientists representing different SMAST labs. 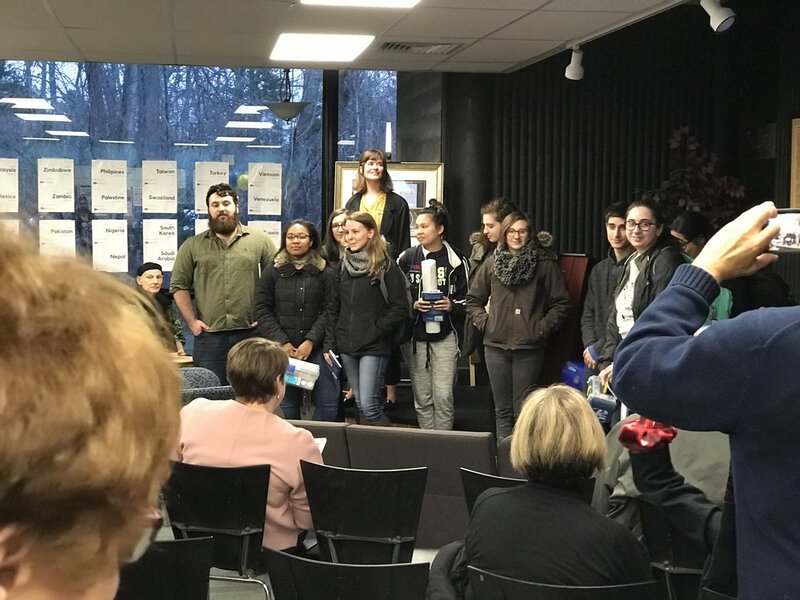 Our team of photography students from CVPA interacted with the scientists and asked questions about their work so that we could make an informed proposal about what we would like to create as public art in their building. We're currently drafting the proposal, and we can't wait to start this project in the spring! For the CVPA faculty and staff holiday party, I made cookie sweaters in honor of a few of my favorite artists. For our final event of the semester, we're hosting a music celebration on Wednesday December 13th, 6:15-7:30PM in CVPA 306! Fingers crossed someone brings an instrument! The Center has buttons! Send me an email if you want one: c.rozalyn@gmail.com! December 4: Student Sabbatical, weaving community, and public art! On Monday November 27, RA Amanda Collier and I co-hosted a textile-waste awareness and weaving workshop using the rugs we started a couple weeks ago with the Leduc Center for Civic Engagement in CVPA! On Tuesday November 28th, I visited David Klamen's graduate seminar to talk about socially-engaged art and the various ways I think of social practice as a medium in art. The organizers of Student Sabbatical, Ben Urdi and Armani Marquez-Chavez, did a great job pulling the show together this week, and it features work by fifteen artists! On Thursday November 30, we had an opening reception that included artist talks at 6PM. In preparation for the publication I'm working on with Brittni Ann Harvey, Jesse Sullivan, Ariana Leo, and Cody Oliviera-Gingras, I took a lot of photos of public art around campus this week! The book launches next Wednesday December 13th! 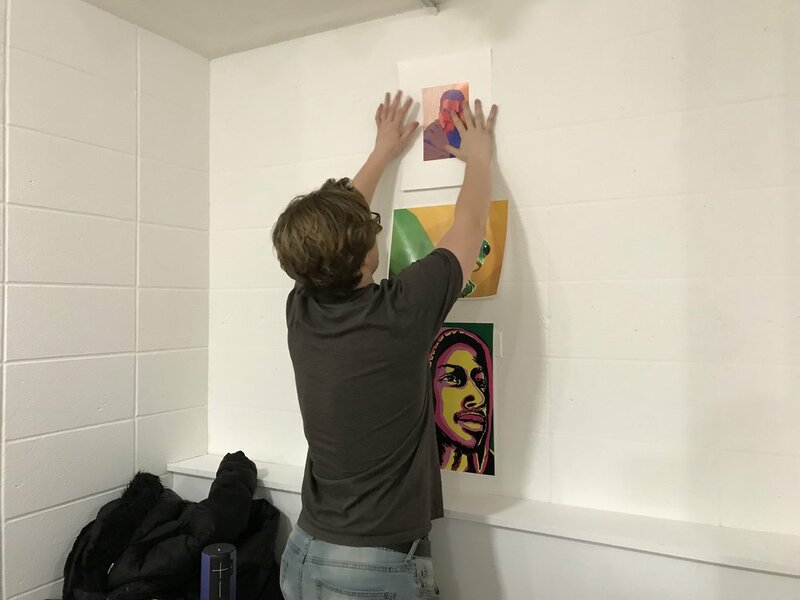 Over the last couple weeks, first-year student Ben Urdi has been organizing for the first show in the new art gallery in Chestnut Residence Hall! Please contact Ben at antfarm215k@gmail.com to submit your work for the show. There's no restrictions about what the art can be. The show opens on Thursday 11/30! On November 17th, the Center's Undisciplinary-Disciplinary Interdisciplinary Liason Rebecca Uchill organized a public lecture by Andy Graydon called "The Spectrum Between: A Listener's Guide to the Art of Sound" at UMass CVPA. This is the first lecture in a new series she's organizing about performance art. 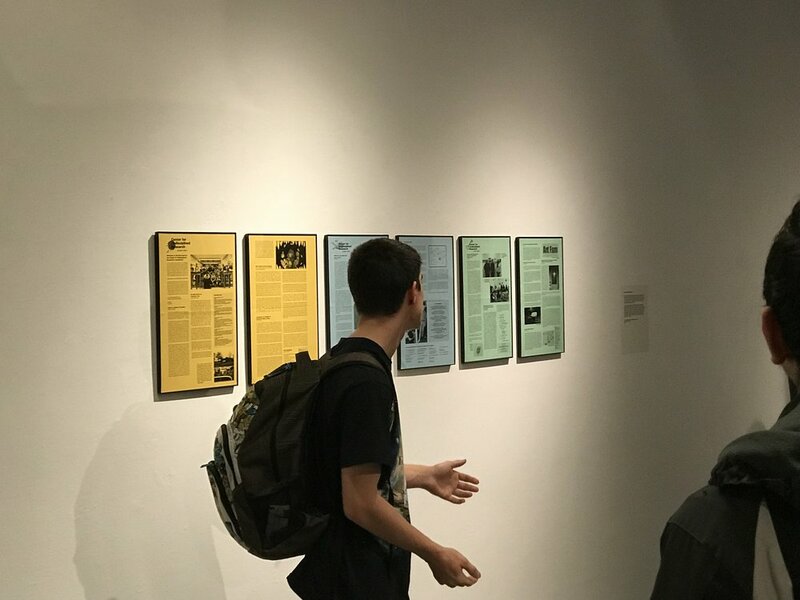 On November 20th, the Center's Curatorial Specialist/Fundraiser Brittni Ann Harvey and the Center's Visual Editor of Undisciplined Research co-led a workshop about interpreting and reflecting on public art on campus. The writing and drawing produced during this workshop will become part of the public art publication we're producing this month! In preparation for the public art publication coming out soon, I sat down with artist and CVPA faculty member Stacy Latt Savage to talk about some of the sculptures and projects that didn't get included on the "very brief tour of public art on campus" map that I made earlier in the semester. We will include her revisions in our catalogue of public art on campus! Above are some of the artworks that will be included in the publication. On November 21st, we hosted a conversation with Jamie Jacquart (sustainability coordinator at UMass Dartmouth) and Marissa Perez Dormitzer (local recycling coordinator) in the CVPA lobby. As we talked about sustainable futures, textile waste, and recycling solutions, we began crocheting two rugs using donated t-shirts. We also discussed artist Fritz Haeg's work and specifically his project Domestic Integrities (where he works with others to produce rugs (Domestic Integrity Fields) from recycled or local fabrics that become the platform for exchange). "DOMESTIC INTEGRITY FIELDS are crocheted rugs of local textiles upon which the project is presented, functioning as a charged sites for testing, performing, and presenting how we want to live. These spirally stitched circular rugs gradually expand as they travel from city to city. Local resident collaborators responding to an open call make periodic visits bringing their Domestic Integrities to ceremoniously place them on low pedestals on the crocheted rug. Some may remain on display for weeks while others may change daily, but there is always something fresh to drink and eat. Visitors to the rug are invited to take off their shoes and make themselves at home, to sit down and inspect, touch, taste, and smell that day’s various Domestic Integrities, which provide a 'live broadcast' of what is happening outside and in people's homes at that moment, in that place, in that season." Learn more here. November 13th: JAS, Magic Moments, Recycling and Public Art! Thursday November 16th - Artist talk with Sage Perrott, Star Store room 144 6:30-7:30. Monday November 20th - Public art and writing workshop with Brittni Ann Harvey & Jesse Sullivan, room CVPA 306 6-8PM! Tuesday November 21st - National Recycling Day Weaving Community Event with the Leduc Center for Civic Engagement, CVPA lobby 10-5PM. Join us as we weave old t-shirts into rugs. In preparation for a new publication we're working on, I've been researching the New Bedford Cinderella Seagull controversy from last summer. Rayana Grace sent me a photo of these stickers that were produced in relationship to the sculpture to raise money for breast cancer research. Radical Digital Painting team Just Another System was here for a couple days last week, and they gave an amazing talk on Tuesday evening - free and open to the public! On Wednesday, the team did studio visits with seven awesome students from CVPA! Here they are with Addie Thibeault right after their final visit of the day. On Thursday during AHA! Night in DT New Bedford, as part of CURE's programming related to the education and engagement wall at the museum, I did a two hour performance where I worked with people visiting the museum to write twelve "scores for magic moments" (free ideas for being emotional in the city). The scores were made specifically for the individuals who co-authored them, and each one begins with the participant selecting one of six objects from the table. I ask which object makes you feel most comfortable, and from there, a series of questions unfolds to help me understand what a magic moment might look like for you - as you talk, I write. Once the score is done, it goes into a tiny envelope, sealed, dated, and identified as yours. The envelope should only be opened when you're in dire need of a magic moment. When CURE was starting to develop, I thought it might make sense to have a uniform for public engagements. Over the last couple months, Addie Thibeault, a junior textiles student in CVPA, and I discussed various artist uniforms, and through conversation, we decided this dress would be the perfect garment to start with since I already have a similar linen dress that I wear for most public events. She selected the fabric and made the dress for me. Last Monday, I gave a lecture about the Center in Maureen Hall's graduate level education class called Critical Literacy. I also talked about some other recent work that deals with literacy, communication, and education. Today I returned to Dr. Hall's class to give a talk called, "Where does learning happen?" This is a photo of my graduate cohort in 2016 when we went to California to visit Fritz Haeg's Salmon Creek Farm project. On Monday, Wednesday, and Friday, I led a workshop called "This isn't good enough" in Thomas Stubblefield's honors class called Scholarship in the Community. We started the workshop by learning about Miranda July's New Society and Public Doors and Windows' Collective Museum in Santa Cruz. We talked about alternative models for living, for education, and for research. As a group, we decided to use the rest of our time together to create a microutopia that might function as a university. We read excerpts from Mary Jane Jacob's Culture in Action, and Ted Purves' What We Want is Free. 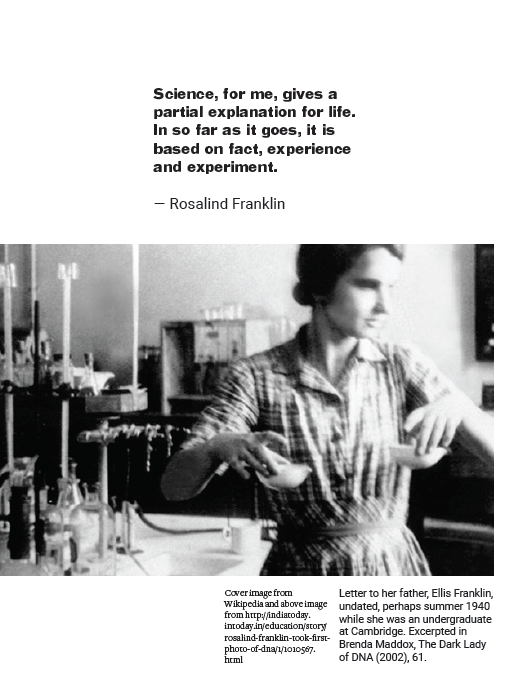 By the end, we created a new university called Rosalind Franklin University (the second - because there's already a university named after Rosalind Franklin), and we thought critically about what we would want in our dream institution. I made a PDF booklet incorporating everyone's ideas which was distributed back to the class. 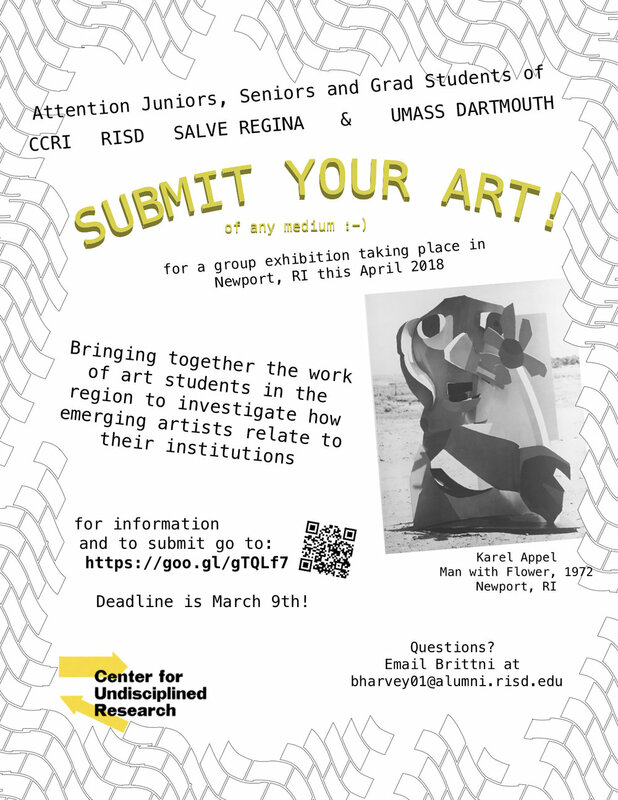 A few of us from the Center are creating a publication about public art on UMass Dartmouth's campus, and as part of their final project in Dr. Rebecca Uchill's Processing Place class, some students are making studio projects that reflect on the public art. We will have a release party for the publication in December! In the last two weeks, I've been meeting with students from Cristina Mehrten's World History classes to help them design their posters and timelines about a tour they went on with National Park Service in New Bedford. It's been really fun learning more about the Underground Railroad and the whaling industry in New Bedford through the lens of these students. I've been working with these super self-motivated folks to create a call for public art on campus! We're looking for students who want to propose a collaborative, public artwork for one of the buildings outside of the College of Visual and Performing Arts. This should launch in the next few weeks. On Thursday we had the official unveiling of the Center's wall at the New Bedford Art Museum! We opened with the Social Justice Hero Portrait project, and Mark Kayanja who inspired the installation gave a very moving speech about why he thinks people who do social justice work are important. On Saturday, I volunteered at the Thornton House site dig organized by Lee Blake from the New Bedford Historical Society. This site is across the street from the Nathan and Polly Johnson House, and it will become the new Abolition Row Park! Ellen Mueller and I facilitated a co-authored story project on the cork board in CVPA as part of the Open House scavenger hunt on Sunday! Each prospective student got the chance to add one word to the story. This cool idea came from Adam Carlin at the Greensboro Project Space in North Carolina. We just released our second newsletter! As part of the Fine Art Faculty Show on main campus, I created this installation about being present in the moment. It comes from a much larger body of work which includes all kinds of documents of my life. This excerpt is called Part II 2006-2013: Times when the people are absent, actually when I was the absent person. Thanks to the gallery attendents for helping to recoil the rope after people check-out the binoculars. October 23rd: Experiments in site-specificity, 100 values, zoo animals, ethograms, psychogeography, and theropods! I had the opportunity to talk about my work and the Center in Catherine Moran's ARH 200 class this week, and I decided to try something new...I started by talking about the first site-specific, collaborative intervention I ever did which was made out of garbage bags at the University of Southern Maine in 2010. I think it was a turning point for me in terms of how I thought about working with other artists, what I thought art was, what I thought the process of making art should be, among other things. So, while this was a really important project for me, I realized that it might not have been very interesting for students; regardless it was a fun exercise in thinking about how the recent past impacts our future-selves. We also talked about the Center, context-specificity vs. site-specificity, and alternative art spaces. This project was born out of a collaboration between a site-specific installation class and a printmaking class during my junior year in college while I was doing an exchange program in Portland, Maine, and I worked with Milo Moyer-Battick, Casey Massman, Cristina Williams, and Mark. I installed 36/53 lists of 100 values from educators who were at the Teaching Social Practice conference. Only one anonymous person completed their list of 100 values in seven minutes. It was sort of an impossible task. I put them up on our cork board so that students could maybe see themselves in these lists, or maybe they would see how different they feel than the folks who are educating them. It seemed like an interesting opportunity. A few of us went on a site-visit of the Buttonwood Park Zoo with the education curator, Carrie Hawthorne, and we're planning to propose some ideas for projects we might do there either in the spring or possibly sooner. We got to visit with some of the Animal Ambassadors who are part of the education programs at the zoo. It was a very special experience, and it brought up a lot of ideas and thoughts for me. Below is an "ethogram" which is something zoo researchers use to chart animal behaviors. From Wikipedia: An ethogram is a catalogue or inventory of behaviours or actions exhibited by an animal used in ethology. The behaviours in an ethogram are usually defined to be mutually exclusive and objective, avoiding subjectivity and functional inference as to their possible purpose. Jamie Uretsky asked me and the Center to make an exhibit for the education and engagement wall at the New Bedford Art Museum as part of the new exhibition "Scapes: Placemaking in the 21st Century," so I've created something that involves an interactive map, a set of cards with scores for imagining your emotions as affected by the physical environment and experience of walking, and a series of three public dérives. All inspired by Guy Debord and the notion of psychogeography. How do different places make us feel and behave? The term psychogeography was invented by the Marxist theorist Guy Debord in 1955 in order to explore this. Inspired by the French nineteenth century poet and writer Charles Baudelaire’s concept of the flâneur – an urban wanderer – Debord suggested playful and inventive ways of navigating the urban environment in order to examine its architecture and spaces. As a founding member of the avant-garde movement Situationist International, an international movement of artists, writers and poets who aimed to break down the barriers between culture and everyday life, Debord wanted a revolutionary approach to architecture that was less functional and more open to exploration. The reimagining of the city proposed by psychogeography has its roots in dadaism and surrealism, art movements which explored ways of unleashing the subconscious imagination. Tristam Hillier’s paintings such as La Route des Alpes 1937 could be described as an early example of the concept. Psychogeography gained popularity in the 1990s when artists, writers and filmmakers such as Iain Sinclair and Patrick Keiller began using the idea to create works based on exploring locations by walking. For the YMCA's Trunk N Treat event this upcoming weekend, I'm dressing myself and my car as the Massachusetts state fossil, theropod tracks! It's been fun to think about how a halloween costume or brief installation can serve as an educational opportunity, both for myself and maybe for someone who comes to get candy from me. I've also been having fun thinking about monoprinting, and to make the fabric for the costume, I carved a theropod foot print out of foam, and I'm using acrylic paint to print with the stamp. Here's what the fossil type looks like. October 16th: Mark Dion, Teaching Social Practice, Shared Voices, Portraits! I want to acknowledge that Monday Updates is inspired by Monday Memos which is a blog that one of my favorite artist people, Zoë Sessums, writes and publishes every Monday. I'm always excited about the music, fashion, and food that appears on her blog. Plus, I think Monday is a good time to read updates about the previous week. In Rebecca Uchill's ARH 390 class I gave a very brief tour of public art on UMass Dartmouth's main campus. We talked about the Center for Undisciplined Research, “The Living Gallery Project” featuring Gerry’s Window by Ron Rudnicki, The Fabric and Nature of Industry by Angelina Marino Heidel and collaborating artist Joel Heidel, the Robert Karam Campanile, and Spinwinder by Nancy Holt. Quite a few of us went to Mark Dion speak last week at the Whaling Museum in New Bedford which is the museum he used to visit as a kid. His talk was very ocean specific, and of course, it was also very inspiring. Mark (and his project with J. Morgan Puett, Mildred's Lane) is one of the many influential figures who has seriously impacted the creation of the Center. This quote from Mark Dion might be the unofficial motto of the Center for Undisciplined Research. We also attended the symposium surrounding Mark Dion's retrospective at the ICA in Boston, and our very own Rebecca Uchill, Undisciplinary-Disciplinary Interdisciplinary Liaison gave the concluding remarks at the symposium! We helped create a scavenger hunt for the first CVPA Open House of the year! Here's our consultant, Megan Abajian with peer mentor Toni. Megan also presented about the AIR position during the Open House welcome session. A lot of the Center's buddies were in town this week for the Teaching Social Practice conference organized by Ellen Mueller! Here's Amanda Leigh Evans, Sidney Stretz, and Adam Carlin. At the conference I discussed the Center as an artwork, and I also asked all of the artist educator people in the audience to write lists of their 100 values which will be posted on the cork board later today. Only one person out of many completed their list of 100 values in seven minutes. Chloë Bass visiting from Social Practice Queens at CUNY gave a workshop about spatial intimacy as part of the Teaching Social Practice conference and CURE's lecture/workshop series. Our wall at the New Bedford Art Museum is looking great, and we were there for a workshop we hosted about talking politics in the classroom. 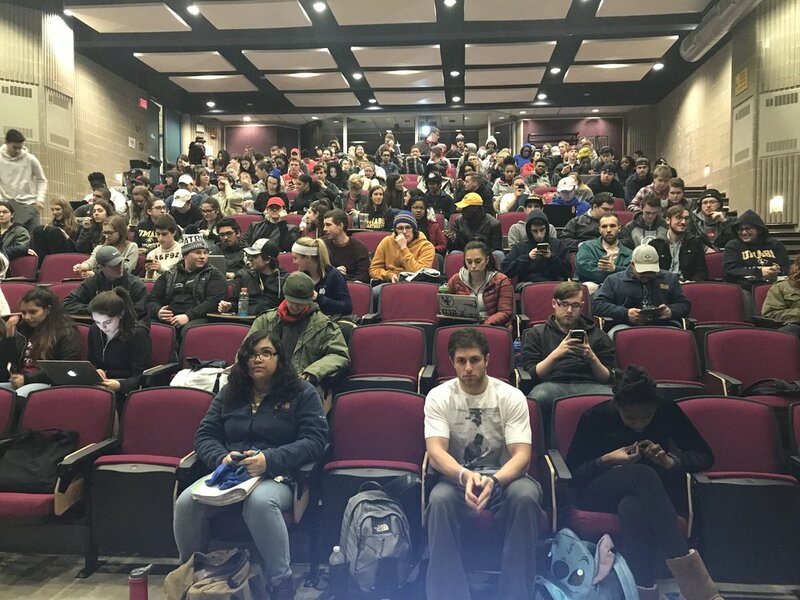 The turnout was great, and in the next few weeks we will publish guidelines for political discussions in art classrooms. 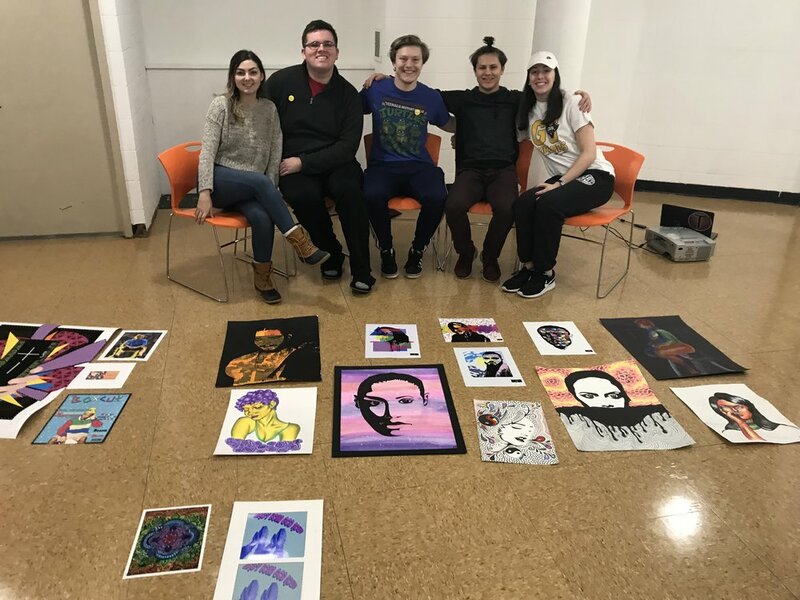 We installed the first exhibition of the year in the Chestnut Residence Hall! It's called Shared Voices and it was made by CVPA Alum Matthew Najarian with participation from 12 UMass Dartmouth students. Please join us for the opening reception of the Shared Voices exhibition! There was a great panel about Shared Voices featuring some of the students who participated. They discussed their views on social justice and making space for political dialogues. We also extended the social justice hero portrait deadline to October 23rd! Please submit. Please plan to attend this lecture on Tuesday November 7th, 7-8:30PM!